Learn more about the Flir E5 thermal camera with key features, pricing information, and frequently asked questions. 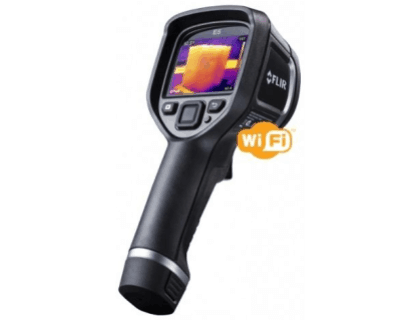 The Flir E5-NIST Thermal Imaging IR Camera with Wi-FI & MSX is a portable thermal imaging camera. The E5 can connect to a smartphone via a wireless internet connection and has several thermal imaging modes. Offers the best image clarity with crisp resolution. Pros: Wi-Fi connectivity. 3" LCD display screen. MSX technology. Cons: No digital zoom or GPS. Bottomline: An accurate, easy-to-use thermal imaging camera that is lightweight and durable. The Flir E5 thermal imaging camera costs $1,549.00. How can I share images from the Flir E5? You can upload images from the Flir E5 to the Flir app so that they can be accessed from a smartphone. What is the battery life like on the Flir E5? The battery is rechargeable and lasts for up to four hours of continuous use. Can I use the Flir E5 to locate areas where heat may be escaping from a building? Yes. Because the E5 is equipped with MSX thermal imaging technology, you can point it at walls, windows, and doors to see where heat might be escaping. What are some Flir E5-NIST Thermal Imaging IR Camera alternatives? Mastercool 52325 Thermal Imaging Camera. AEMC 2121.40 1950 Temperature/Infrared Imaging Camera.